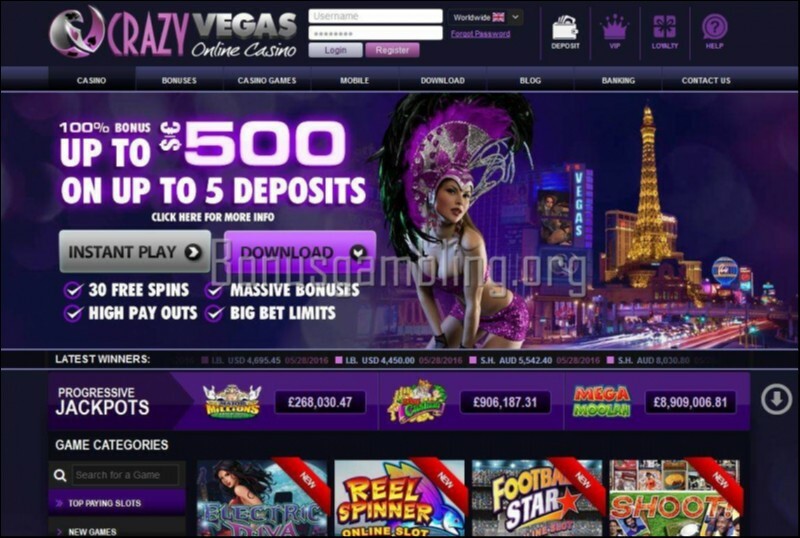 The best online casino to visit if you are looking for a crazy, Vegas-style gaming experience is, of course, Crazy Vegas! This is another great casino from the Vegas Partner Lounge group of online casinos and is sure to keep you glued to your seats as you try out the different games on offer. The casino has it all – a great-looking home page with some excellent graphics, a good selection of games, and all else that goes into making a casino the perfect choice for players to play at. The elegant color scheme of the background contrasts sharply with the bright coloring and texture of the foreground, complete with attractively designed content, and hits the visitor’s eye the moment they land on this page. The layout of the entire site is superb – you get all the crucial information right on the home page – the number of games, the promotions, the payment options, currency options, information about the owners and about licensing and registration, and the software provider – right on the home page. The Crazy Vegas casino runs on software from Microgaming, one of the leaders in online gambling software development. The software is available in both download and instant play modes. The features it provides include a mobile casino, smooth gaming, quick downloads, superb visual and sound effects, tracking of players’ play and transaction histories using the PlayCheck and CashCheck features respectively, state of the art security, a certified random number generator, and much more. When you talk of the games available, the Crazy Vegas casino is right up there with the best, offering you a choice of more than 300 different games to play. The games available include a variety of slots, blackjack, craps, roulette, specialty games, video poker, and many others, including a set of massive progressive jackpots. The casino also offers multiplayer blackjack and slots tournaments. Some of the other highlights at the Crazy Vegas casino include some excellent multilingual customer support from a dedicated and thoroughly professional customer support team that is available 24x7, state of the art security through the use of 128-bit SSL encryption, and complete fairness in all games. The casino in fact has been certified for fairness by the eCommerce and Online Gaming Regulation and Assurance (eCOGRA). The Crazy Vegas casino is licensed by the Kahnawake Gaming Commission and authorized by the Lotteries and Gaming Authority of Malta. This casino currently does not accept new players from the US, though existing players from that country are allowed to continue playing.